When people talk about “breaking down” an opponent, most of the time it’s talked about in fancy tactical terms. But these types of sequences are equally as important. It’s a bit sloppy and chaos runs a bit rampant, but that benefits the attacking team as well as the defending one. Kaku makes a great run into space on the wing with DC United having six defenders (plus the keeper) solidly in and around the 18 yard box. 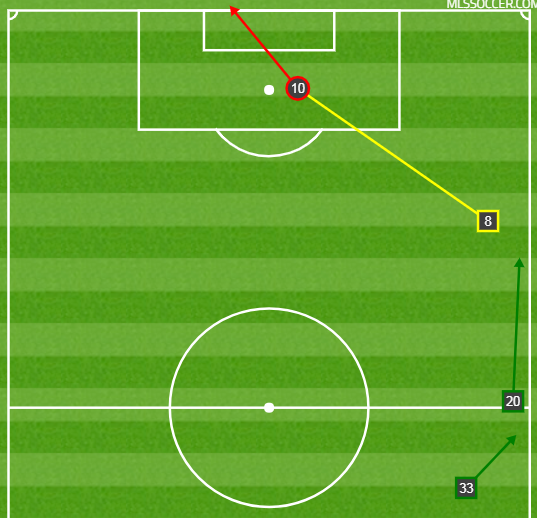 As he gets a couple of steps towards the end line neither Bradley Wright Phillips or Marc Rzatkowski are open. Now, if this ball is crossed through the air it’s 80-95% probable that no Red Bull wins the dual or even manages to direct a header dangerously towards Bill Hamid's goal. So instead of putting a ball up for grabs Kaku drives a pass towards open space. The quick and observant runs of both BWP and Rzatkowski to the near post lead them to winning the ball before the DC defense and Rza even redirects the pass, causing a bit of trouble for Hamid who can’t hold on to it. Obviously the positioning of the shot is dangerous. Just getting a foot on this and steering it near the frame forces Hamid into a save and potentially gives a the Red Bulls another chance. But considering the shot also comes from a crowded spot, it further complicates the save for Hamid. Where you take a shot is important, but the added benefit of taking one in a crowd complicates the save for the keeper and gives more hidden xG than what’s on the surface. Romell Quioto and Alberth Elis are such an underrated dynamic duo. They just rip this backline apart time and time again. Some of that credit goes to the tactics deployed by the coaching staff. Alvas Powell gets too far forward, and as soon as the turnover is created Quoto springs forward creating the opportunity. Powell will get a lot of the hate mail on this but if you watch the other side of the field, Zarek Valentin, the other full back, is pushed up even further. It leaves a ton of space on the wing and it’s how Houston feasted. Once more, just to reiterate, I’m not sure I blame Powell or Valetin, as much as I blame Giovanni Savarese. It’s super odd and the only thing I can think of is the coaching staff thought Portland was a better possession team than Houston was at creating turnovers in the central midfield. In this game they were obviously wrong. Houston keeping a high line and creating those turnovers in central midfield is what enabled Quioto and Elis to expose the free space on the flanks and get behind the centerbacks to create a high leverage opportunity. I don’t know which to highlight. The Valeri-Blanco connection or this terrible defensive display by Houston defensive duo. Diego Valeri. Without a doubt. The dude has just been such a high level of good for so long that seasons like this just seem "more of the same". Let’s start with Diego Valeri. His sauve and general smooth demeanor on the ball is thrilling. It’s like watching a soccer version of James Bond. He just takes his time and does exactly what he wants. He isn’t troubled one way or the other and just allows the play to develop and Sebastian Blanco to make his run from midfield. I’m in the small majority that takes Valeri over Diego Chara as the best player for Portland this season (again, that’s not to undercut what Chara does both tactically and defensively) but hear me out. Valeri is 5th overall among expected goal chains (30.08) in Major League Soccer. But specifically he’s been exceptional in the attack the second half of the season. He went from 0.97 expected goal chains per 96 between March and June to 1.35. The thing is while Portland hasn’t been as good in the second half of the season that isn’t specifically tied to either Chara or Valeri, but rather tactical and man management issues. Despite Portland only giving up 1.29 goals per game, their xG against from March to June was 1.49. July to this past weekend their goals against had regressed back to 1.39 with their expected goals against being 1.43 with Chara splitting nearly equal times between those two halves. Again, Chara is a big piece for this team and I hate using a team’s defensive numbers to represent one specific player. 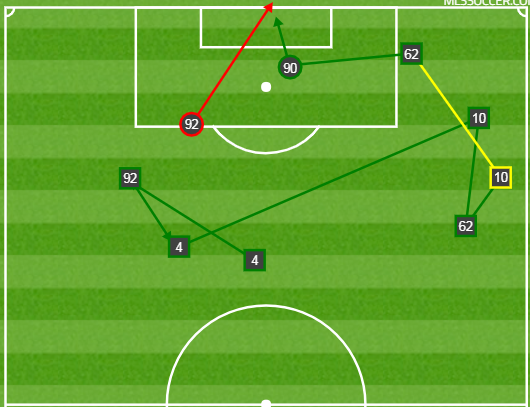 That said, what Valeri does in the attack is continually special and continually underrated. He’s a top five player at his position and still the best player for the Timbers. Looking back at the awful Houston defensive display; this has been a continually issue for the Dynamo over the season. Their underlying numbers are solid but their actual numbers are terrible and that’s in large part because of the (lack of) quality of their defenders, which have continually given teams better opportunities than they deserved. And just like how Chara is a big tactical piece, so was Juan David Cabezas who has been MIA with injuries over the course of this season. I’ll bang this drum over the next couple years, maybe more if or when they sell Elis and Quioto, forcing the team to once more rebuild. They have missed his contributions greatly and he might be the difference between them making the playoff team and creating a run at MLS Cup instead of missing the playoffs entirely. Has Shkelzen Gashi been good? Serious question. He got a lot of praise his first season in MLS because of the crazy and unexpected run that Colorado went on, but since then he’s been largely missing in the first team and when he’s been around he hasn’t been special. I know this sounds a bit drab and most are trying to focus on the good things that Colorado has going for it...which isn’t very much. But the team is going to have to make a decision on Gashi this off-season and I can’t for the life of me think of any reason to keep him. His 2016 season wasn’t too bad and while this season he’s helped plenty on the build up, he’s not been the creative or scoring force he was brought in to be. Which, with looking at Colorado, is a much bigger deal even more so with a lack of ability in hold up. His buildup play is probably on par with Boateng, Jack Price and Kellyn Acosta, all of which are more cost-effective options. He could still be a viable option if Colorado continues to move forward with a diamond of four central midfielders, but I’m not sure that’s a long term solution and it’s hard to say what their plans are headed to next season. He’s still only 30 and is finally healthy, so it’s possible that a return to 2016 form could happen. But that would mean they’re going to need to find “the” guy to couple with Gashi and also Acosta. Brek Shea sends in this pass and I hate it. It’s an awful, desperate move with plenty of time left in the game. It’s made without their best scorer, Kei Kamara, having any chance at winning the ball and it’s made in a situation where there is two defenders for every one attacker in the box, not to mention the keeper is in there too. This, in a nutshell, is just about everything that Vancouver is. It hurts me even more because they don’t have to be this way. The most remarkable thing about this is that Cristian Techera, all of 5’2”of him, wins the second ball and redirects the header in the path of Jordan Mutch. This is where Vancouver's luck turns, if only for just a quarter of a second. Mutch manages to get his left foot on the ball tries to redirect it on frame. Where it skips across the open goal mouth untouched and just goes out of bounds. It’s kind of a hopeful moment that goes sour quickly. 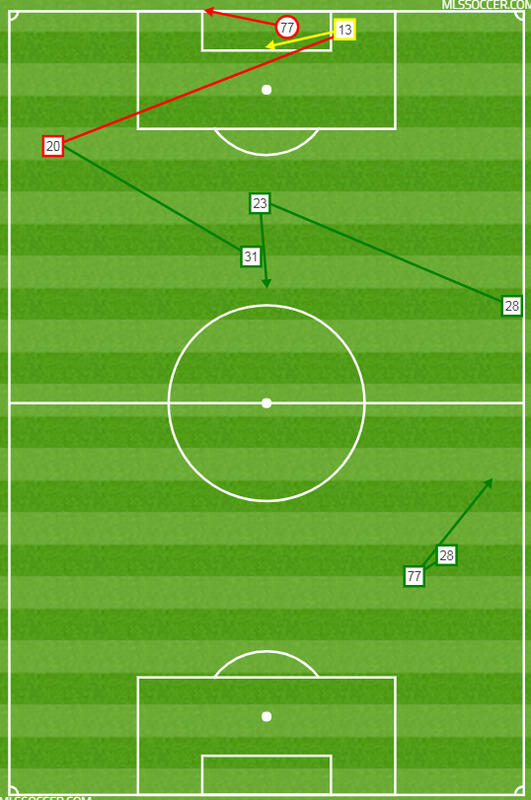 And the true crime in all of this is watching Alphonso Davies basically give up on the play. Once Shea gets he reads the eyes and knows exactly what he’s going to do. Which, realistically speaking isn’t terrible except for the circumstances as they were mentioned previously. What I wish would have happened was Davies made a near side post run before Shea shifted his body weight, giving him another option. At least then Davies is inside the box and close to goal with more than a few options surrounding him to try and create something. This might be the most SKC moment played against SKC all year. 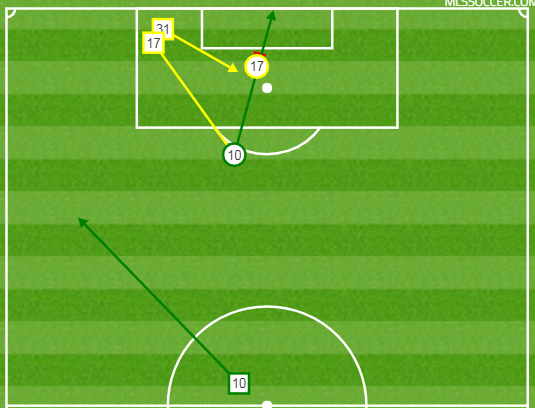 Danny Hoesen gets on the ball and just runs at the backline. As everyone is in transition Hoesen takes advantage of the bit of space ceded to him by Matt Besler and takes a quick shot at goal. While Hoesen is the one that takes the shot, the build-up by Luis Felipe Fernandes, Jackson Yueill and Nick Lima is worth focusing on here. Lima cuts in to the ball before Gerso Fernandes, and then quickly dispenses the ball to Yueill. Lima is an undervalued full back in this league and is probably worth a look as a Gold Cup tournament level left back but that’s a topic for another time. Yueill gets the ball from Lima and just plays it real simple. SKC is quick with the pressure on the ball, so Yueill cuts back and drops it off to Fernandes, who sends the ball forward with a quick snap, exploiting some of the vacated space. Fernandes has been someone of note since arriving in San Jose but most of that is for his defensive prowess. If he’s able to continue to progress with his ball skills and passing it’s possible that he might be very special. As much as San Jose has been bad at the whole soccer thing this season, they have had a semi-serviceable attack. The real issue has been on the defensive side of the ball where their opponents are just getting way too many high leverage opportunities right up the gut. If Steve Ralston can find a way to defend against what he was so notorious for exploiting over his 14 seasons in MLS, San Jose could make the remaining weeks entertaining. That’s all for this week’s edition of Lowered Expectations. I hope it lived up to yours. An extra big and very special thank you to my podcast mate Ian for providing the high quality GIFs for this post.